She Took This Candid Shot Of The Server And Accidentally Changed A Stranger’s Life! When Laura Wolf sat down to eat, she had no idea that her day was about to be changed for the better. She also had no idea that she was about to change a stranger’s entire life for the better! 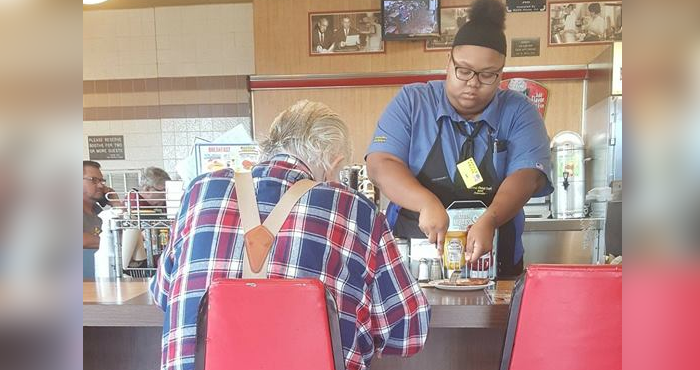 While waiting for a table at the busy Waffle House, she noticed an elderly man sitting alone at the counter. He reminded her of her late father, and while she didn’t approach him, she kept her eye out in case he might need help. She watched as a friendly young woman stopped to ask him if he was alright, when the man’s voice caught her off guard. He’d asked the woman a question, but his explanation is what caught Wolf’s attention. ‘My hands don’t work too good,”‘ the man had said. The woman, without an ounce of hesitation, began to cut his breakfast into small chunks. It was a small gesture, something easy for many people not to think twice about. But, for that man sitting alone, it was everything. It was one less thing for him to worry about, and Wolf was touched beyond words. She snapped a picture and shared it with her friends and family later that day. She had no idea that so many people would share it, or that it would be seen by millions of people around the world! Eventually, the woman was recognized. The 18-year-old was given a promotion and a $16,000 scholarship to go to college, and many people agree that she deserved every bit of good karma that came her way.